The goddess' name is related to the root tef, "to spit, be moist" and nu, "sky, waters". Appropriately, she was the personification of the moisture of the sky. 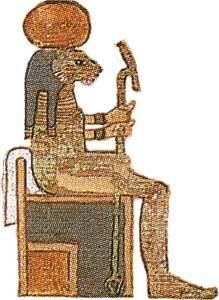 Tefnut was the counterpart to Shu and the mother of Geb and Nut. Tefnut and her husband Shu were the children of Atum who created them by masturbating. When Atum became associated with Re, Re became Tefnut's father. According to one myth, Tefnut became angry with her father Re and ran off to Nubia. The god Thoth went to find her and conjoled her into returning to Egypt. Tefnut was depicted in the form of a woman who wears on her head the solar disk circled by two cobras. She holds in her hands the sceptre and ankh. Many times she has the head of a lioness or is shown as one.